RAYMAN ORIGINS RIP DYCUS-RAZOR1911 ~ The Best GamEs.. SpOt !!! When the Glade of Dreams is overrun by “nefurrious”Darktoons, the Fairy Council hastily invokes Rayman to save the day; but the hero of light isn’t quite all there…To help him, Rayman teams up with his best friend, Globox, and two crafty wizards, the Teensies. Together, the world’s most hilarious team of heroes will need to restore peace to the Glade or watch as their beloved home vanishes like a bad dream…Rebirth of a Platforming Legend: It’s been 15 years since the first launch of Rayman. 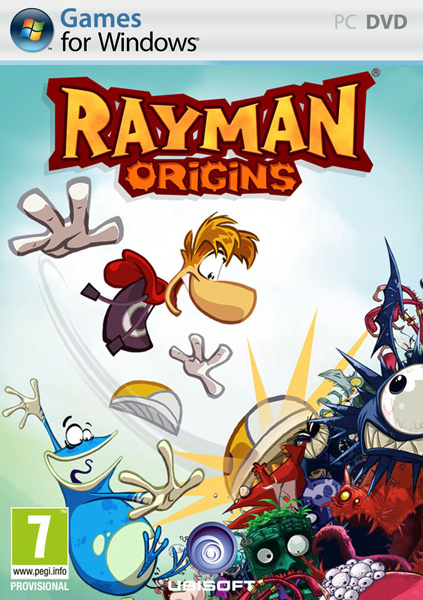 Rayman Origins brings back many of the classic characters, revived in their original 2D form, as well as a whole new world of characters and environments. Discover the roots of Rayman by collecting pieces of the Glade’s history, and assemble them to reveal the truth behind Rayman’s origins. 4-Player, Jump-In/Jump-Out, Co-op Gameplay: Play as Rayman in the solo campaign, or have up to three friends jump in at any time to play as Globox or as one of the twoTeensies. Players can leave at any time without affecting the others’ progression. A Vast Playground: Rayman Origins includes over 60 levelsof 2D platforming gameplay designed for all ages and playing styles. Unlock new abilities progressively and return to previous levels to discover new paths and secrets. Variety of Gameplay: Rayman Origins is a platformer at its core, but it has elements of many game genres. Rayman, Globox and the Teensies gain unique abilities as they progress through the adventure, including swimming, diving and the sensational “HairlyCopter.” The game also features many elements of action, adventure and beat-’em-up gameplay.